J.J. Watt capped off a fantastic comeback season with a strong game, in which he made an impact all over the field. He had a couple of sacks and added even more pressures that affected Blake Bortles throwing the ball. In the run game, he made a handful of solo stops. He was just so tough for any of the Jaguars linemen to block, and he wreaked havoc on the game because of it. Kareem Jackson had a great day for the Texans defense, allowing his first catch late in the game when they were basically just playing prevent defense. He had a great pass breakup earlier and was locking down Jaguars receivers in coverage. He also was a factor in the run game and made some big stops. DeAndre Hopkins won his matchup against Jalen Ramsey, as Hopkins was too strong at the catch point for Ramsey. Hopkins ended the day with 147 yards on 12 catches and was the main weapon for the Texans. The downside for the Texans was the inability of the offensive line to pass block on a consistent basis for DeShaun Watson. When they hit the playoffs, the biggest weakness of the team is the offensive line and might be too much for the Texans to overcome. There was really nothing good about the Jaguars’ offense in this game. Bortles, getting the start a week after he didn’t start because he was benched the week before that, played at the exact same level that got him benched in the first place. Early on, he basically only looked to check down for easy completions. When he tried to push it, he either missed or threw it to a Texans defender. He sprinkled in some good throws throughout the game, but most of them were dropped by his receivers. The Jaguars got absolutely nothing out of their run game. Their offensive line could not block any defender on the Texans, and it led to a measly 15 yards on 12 runs by their backs. All of those yards came after first contact too, as the backs were constantly hit in the backfield. Carlos Hyde didn’t do anything in place of Leonard Fournette, breaking just a couple of tackles and dropping a target in the passing game. 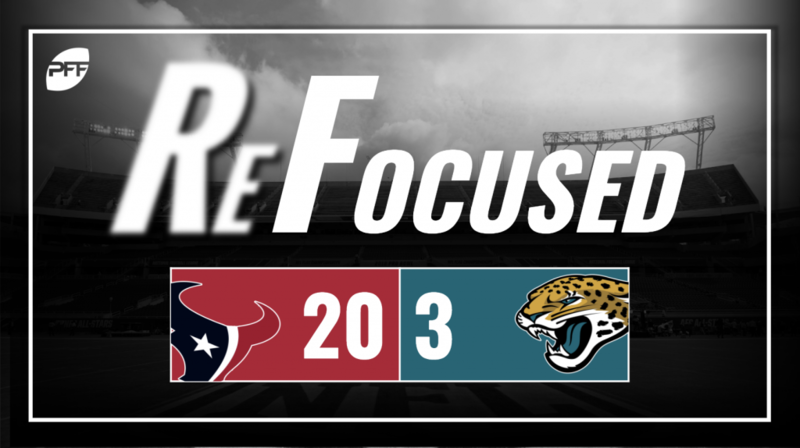 Jacksonville’s defense consistently pressured Watson, as Yannick Ngakoue and Calais Campbell won in different ways and were too good for the Texans line. Ngakoue was won consistently with speed, while Campbell won with more power to combine for three sacks between them. Telvin Smith was all over the field for the Jaguars’ run defense, as he led the Jaguars in tackles. The biggest issue was he also led the team in missed tackles. The Jaguars lost this game because their offense just made zero plays. Bortles was bad, the receivers were bad, the offensive line was bad and the running backs were bad.